I never imagined this would be a difficult entry. A Hallow'een-themed wine column...easy, right? I figured there would be any number of selections lending themselves to the cause. A quick trip down the beer aisle would keep me in business for weeks if I were writing about hops instead of grapes -- from the Rogue Dead Guy Ale; to Duvel from Belgium (that's "Devil," in case you were wondering); to Hobgoblin IPA; to the countless pumpkin flavored beers lining the aisles this time of year. Wines, for the most part, held themselves back from this lean towards the lurid, although I did see a display of zinfandels in a coffin at one store. Personally, I find wine much more closely linked to this time of year -- as the weather turns cold, the winds begin to blow, and the air itself seems to crackle with a certain energy. Wine's depth and evolutions in flavor fit autumn well for me. Wine warms us against the cold, and mirrors the season's changes outside. Plus, since it's Hallow'een, it kinda looks like blood. Schmitt Sohne 2005 Zeller Schwarze Katz -- No Hallow'een would be complete without a black cat, and this German entry is generally welcome to cross one's path. "Schwarze Katz" is the German translation for the traditional Hallow'een feline -- and is also the name of this wine's vineyard, which is near the village of Zell. This wine is produced from Riesling grapes --and falls in the "basic" category of German wines. That said, if you want the experience of bobbing for apples without getting your face wet, this is a good bet. The nose is lightly perfumed with scents of those apples. The taste is light and crisp, with more of that slightly sweet, slightly tart apple taste -- like a Honeycrisp. The finish is quite long. The fruit flavor holds on for a good portion of the dark evening. This would be excellent as either an inexpensive aperitif or dessert wine. You could also pair it with lighter style foods. With the apple taste in mind, I paired it with some brined pork chops and sweet potatoes, and it worked wonderfully. At $6-9, it's a solid buy -- and I don't think you'll have bad luck. Yarraman "Hell Raiser" 2004 Cabernet-Merlot -- This Australian number is unrelated to the Clive Barker horror story or Pinhead, but, instead from a horse boarded on the winery's grounds who saw great sport in kicking down his gate and committing various other acts of mischief. This wine was initially known as "The Bolter" -- but I imagine they wanted nomenclature that would be a little more universal to Americans not on the plains or in the Bluegrass. While I'm not driven to attack fences after tasting this wine, I do think that it's very decent for a chilly evening of jack-o-lantern carving. Hell Raiser is 50% cabernet sauvignon and 50% merlot, but I believe the latter grape takes the lead in the taste of this wine. This wine smells more like a merlot to me, with plenty of blackberry -- although there's an interesting minty scent as well. The cabernet becomes evident after you taste. The strong dark berry and plum nature of the merlot gets balanced with the cabernet tannins especially evident on the finish, which is long and dry -- with a flavorful dark chocolate aftertaste. Try this wine with dark chocolate -- it's an absolute killer. You could also put this with some sharp cheddar cheese and crackers to get your trick or treating started right. And for $9-10, open this well before the costumed children arrive and you'll be in a mood to handle whatever comes to your door. On a wine to serve my guests as they wandered 'bout my floor. "'Tis a simple wine I need, something folks would not abhore." A little something I'd picked up upon my last trip to the store. "To now relax, to have with cheese, and appetizers more and more." Emerged successful with a bottle few themselves would dare deplore. Two thousand three the date upon removal from its barrel's store. While gold it's not, no problems I would have now mining deep its ore. So then I did perchance to pour. That I'd erred and bought a wine my friends might cast upon the floor. "They'll drink this up, I know them all, and they'll ask for more, señor." I know my pals. Them I adore. Closing out my tasting -- blinked and came from rapport. At dinner big, or even if you're watching for the baseball score. Jessie Red -- arguably the sweetest creature to ever put paws to soil. 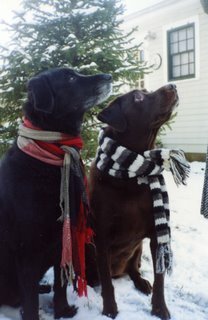 A chocolate lab whose smiles could light a room, and whose flatulence could clear it just as quickly. 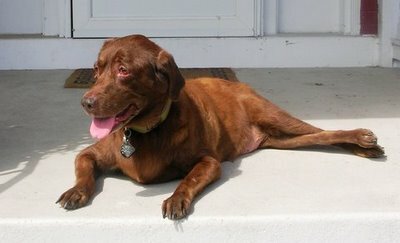 A chocolate lab with a lust for life that put Iggy Pop's to shame, and with a knack for mischief that…well…put Iggy Pop's to shame. Jessie was adopted a few weeks too young, so she never truly understood that there actually was a difference between human and canine. She saw herself as human and acted accordingly. Everyone entering the household deserved a proper greeting (she was always a proper lady) -- even if that meant bowling them over before drowning them in joyful slobber. People food was obviously prepared for her -- as was discovered upon walking into the kitchen to find Jessie hungrily devouring the second of two enormous porterhouse steaks that she'd jumped onto a counter and then onto a shelf to reach. Jessie would scarf down pretty much anything in reach, and she marginally preferred beef to recently-worn underwear. So, aside from sentimental reasons, what's a chocolate Labrador retriever doing in a wine column? Again, Jessie never understood what was and wasn't meant for dogs. Pam returned home from a long day in the salt mines of her graduate education to her usual enthusiastic Jessie Greeting, only to find shards of wine bottle glass all over the kitchen floor -- and nothing else. She'd left a wine bottle too close to the edge of the counter and Jessie -- in her ever-curious way, had knocked it off -- only to have it shatter. Jessie was a resourceful critter, however, and wasn't one to waste good wine. So she drank it. All of it. Every drop. Carefully. A panicked call to the vet followed. The vet asked if she was bleeding -- she wasn't. He gave the advice: "Keep an eye on her and make sure there are no signs of internal bleeding. Otherwise, just watch her." Jessie was skillful. She didn't cut herself at all. But, after the equivalent of five glasses of cabernet, Jessie had a BAC of approximately .23. She was very happy that night -- walking around with her usual big grin, and then staggering into walls, cabinets, before finally lying down to enjoy her buzz. And, yes, she was a bit hung over when all was said and done. Vinum Cellars "Pets" 2003 Petit Sirah -- Jessie would have been the wrong critter to ask about petit sirah. She didn't have much of a discriminating palate. However, she would have gotten along famously with "Tanker" -- the vintner's lab, featured on the bottle. Many people think Petit Sirah and Syrah are the same grape. While both grapes make big, bold wines -- petit sirahs tend to be extremely dark in color, almost black, and yield big, bold flavors and strong tannins -- much stronger than the mellower syrah (or Shiraz, which is the same grape). This wine needs to be opened and allowed to breathe for at least half an hour, but it's definitely worth the wait. The nose of this wine is powerful and fruity -- big scents of blueberry and blackberry. If you don't let it breathe, however, the fruit gets quickly overtaken by those signature tannins. However, with a little time exposed to air, the fruity complexity holds strongly against the tannin -- giving you a deliciously interesting flavor. The finish is long, spicy, and chocolaty. This big wine pairs up well with big foods -- roasted chicken or vegetables in sauce, prime rib, barbecue brisket. It also would go wonderfully with dark chocolate or big aged cheeses. Take the plunge with Pets to the tune of $12-15. And, in staying with the charitable theme, a portion of the sales go to the San Francisco Society for the Prevention of Cruelty to Animals. Finnegan's Lake "Fin." 2005 Chardonnay -- Jessie was full of surprises, and this chardonnay, with a profile of the puppy that is the wine's namesake, certainly gave me a start when I tasted it. I'm not a huge fan of California chardonnays these days -- they're often too oaky for my tastes. However, this wine is light and subtle, much unlike Jessie -- although both would be great fun at a summer picnic. The "Fin." reminds me much more of a French Chablis than of most chardonnays you'll run into from California, as it has a much lighter, much more lemony nose than most chardonnays you'll run into from there. The very fresh body has notes of vanilla and only a little bit of oak. The finish is long and light with just a little bit of spice. If you're not into the heavy oak or very buttery style of most California chardonnays, you'll become a fan of Fin. Light pastas, almost any type of grilled or baked fish & shellfish would probably go extremely well. Chablis and oysters is a classic pairing, and this would probably fall right in line. Thai cuisine would also be a nice pairing, especially if fish sauce is in the preparation. You'll probably end up between $11-14 for this wine, so if Chablis-style chardonnay is your thing, you'll probably like it a great deal. Fin is a decent American substitute for a classic French wine -- and since the French were some of the first Europeans to trade with the indigenous population of the Labrador region of Canada, perhaps it follows that Jessie's wine would be more French in style. McNab Ridge "Fred's Red" 2006 -- This syrah/zinfandel blend from Mendocino County would be good to have around the house as we start donning (or growing) our winter coats. Fred is the McNab Shepherd namesake of this winery's whose picture adorns the bottle. Much like Mooch -- this wine is quite straightforward. This is a just-released wine, so I'd be interested to see what a few months or a year would do here -- but it stands up now nicely enough. There's a very full nose here for such a young wine. You get a blueberry and cherry scent at first -- and you can also tell you've got a wine that's got a bit of alcohol in it. There's fruit and very solid tannins in the body, with a long finish of smoke and licorice. Right now, the muscle of the syrah is the dominant flavor. I'd be interested to see if the fruit of the zinfandel balances the tannin as the next year or two passes. Big meats, of course, will go well with this -- but I'd be interested to see how it would stand up to a baba ghanouj or other strong eggplanty dish. Fred's Red nestles into your wine rack for right around $10. The Sun Also Rises...and so does my glass. Spanish wines, among many other sensual pleasures of that great nation, became well known to the world in the writings of Hemingway. ("This wine is too good for toast-drinking, my dear. You don't want to mix emotions up with a wine like that. You lose the taste." -- The Sun Also Rises) And Papa certainly had good taste. In addition, since October is Hispanic Heritage Month -- Spanish wine becomes a natural fit for this week. Spain is the world's third largest wine producer. Spain has a long, storied history of wine production -- but only in the last ten years or so have these wines really started to gain a solid foothold around the globe. The Iberian Peninsula has historical evidence of wine dating to around 1100, but if you're a Biblical scholar, Noah supposedly planted the first vineyard 5000 or so years ago. "Modern" winemaking came to Spain in the 1850's and 1860's. As longtime readers will astutely recognize, that was the approximate time of the phylloxera outbreak in France. (For my new readers -- phylloxera is a species of louse that wiped out huge portions of the European vineyards over 150 years ago. Jump back to my article on Chilean wine to read more.) French winemakers, fleeing the devastation of our little pest, crossed the Pyrenees in droves, bringing grapes and know-how with them. Spain's vineyards were largely spared until the turn of the century, when phylloxera eventually made the migration across the mountains. The vineyards made it through in much better shape, and the techniques were in place to craft wonderful wine. In the last 30 years, Spain has also benefited greatly from the technological Renaissance that has done so much for South American wines. Spain started producing a great deal of quality, easy-to-find, easy-on-pocketbook wines in the last ten years or so. The winemaking tradition in Spain was to age wines for a long time in oak before bottling -- creating a number of mediocre wines where the subtleties were overrun by the wood. Spain has been quicker on the trigger to release wines in recent years -- although Spanish wines do tend to improve with a little aging. If you see "Crianza" on a bottle of Spanish wine, it's been aged at least two years. "Reserva" indicated three years aging, and "Reserva Especial" is at least five years old. Spain has two major red varietals -- Tempranillo and Garnacha. Garnacha is the same grape as Grenache, which is the backbone of many of the best French Rhone wines. Also from France comes the nomenclature -- as many Spanish wines are named after their locale. The best known region for French red is Rioja, although Peñedes is another big producer. Navarra and Campo de Borja are also up and comers. Spanish reds are often earthy and fruity, and you'll rarely find a red that doesn't at least have some wood with the tannin. Among whites, the two most common varieties are Albariño and Verdejo. Albariño creates very perfumey, wonderful whites -- much like viognier. Verdejo is a very interesting grape -- like a less-acidic sauvignon blanc with some pepper thrown in. It's often blended with sauvignon blanc. There is also a wonderful sparkling wine, cava, made in Spain -- but I'll come back to that later. 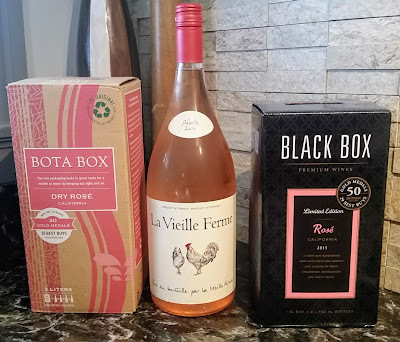 For this week, three wines -- ranging in region, variety, and color. Artazuri 2005 Garnacha -- As I mentioned, Garnacha is the same grape as Grenache -- backbone of many of the big earthy French wines. In Spain, however, Garnacha delivers a very different character. Rather than the earthy smell of this varietal's French cousins, the Artazuri, grown in Navarra, comes straight at you with bright, fruity character. The nose of this wine is wonderful -- while there's a touch of earth, the overwhelming scent is of black cherries and plums. The medium body of this wine is peppery and fruity -- zinfandelesque. The finish is long and a little spicy, with the cherry flavors from the body hanging around a good while. While I probably wouldn't pair this with a steak, barbecue would go fantastically well with this, as would, I think, a curry that's got some potatoes or other earthy veggies in it. This wine would be extremely food friendly, so you can't go wrong -- as long as the food has a little bit of heft to it. And for $9-11, anyone at a party would be happy with this. I also think you could buy several and easily hold on to this for six months or a year, and you'd really have something. Borsao 2005 Rosé -- I've been long overdue for a rosé review, and I figured I might as well look at one since there's such good red grape stock here in Spain (and since I enjoyed my last Spanish rosé so much). Borsao's rosé is made from 100% Garnacha grown in the Campo de Borja region. This dark pink entry greets you with a floral nose that includes some easy peach scents. This wine's gentle first taste is very light and includes more of that nice ripe fruit. The taste lingers briefly before spreading into a long, citrusy, slightly spicy finish that includes some hints of cinnamon. While this would be a perfect summer wine -- as the weather starts to turn colder, pull out some Mediterranean style recipes and do some roasting: whether it's a slow-cooked chicken, an earthy chickpea and eggplant dish, or some marinated pork chops. There's a braised monkfish recipe I once put together that I think would go wonderfully here, and you can find a bottle of Borsao for between $6-8. A good, flexible entry. Las Brisas 2005 Blanco -- Might Las Brisas is from the Rueda region, and -- while it's getting a little late in the year to discuss a wine this light -- keep this one in your memory banks until next year rolls around and the weather starts warming up and you can kick back outdoors again. The lively Las Brisas is one of those aforementioned blends of Verdejo and Sauvignon Blanc, and has a lot of the recognizable character of the latter. The grapefruitiness of a sauvignon is certainly present on the nose, but it's somewhat mellower, balanced by a mangoish scent. It's a very light wine -- a little tart and lemony, but the acidity mellows quickly into a fruity peppery body and a strong, flavorful finish. This would be a wonderful aperitif or poolside wine, but if you have any kind of fish dish -- I had this with a baked cod -- you're going to be in business. You could also consider a cheese tortellini, or most any kind of Spanish dish that doesn't involve beef or pork. Probably plan to spend $8-10 on this very easygoing, happy wine. So lift a glass of Spanish wine this week, and until next time…Arriba! Whatever a person's opinion of the movie, one fateful line stands out -- Miles' immortal rant just before his double date: "If anyone orders Merlot, I'm leaving. I am NOT drinking any f***ng Merlot!" And thus began the decline of the merlot grape in the United States. Merlot's been grown in France since the 1st Century, but was cultivated as a major varietal starting in the 1800's. Some of the most famous Bordeaux's in the world use merlot as a major grape. (The 1990 Chateau Petrus is a merlot that currently goes for about $1700 a bottle). Merlot is also a very common blending grape. If you get a cabernet sauvignon from just about anywhere, chances are that there will be at least some merlot mixed in. Merlots are generally drunk fairly young, as they don't have as much tannin as many grapes. So what's the deal with merlot, anyway? Why the awful reaction of our buddy Miles? Honestly, I have no idea. Merlot is a very "accessible" red wine. By this, I mean that it's a red wine that can go with most any food; has enough body and flavor to stand up on its own; is interesting enough for connoisseurs, but isn't so dense, dry, and complex that someone couldn't just pick up a glass and say, "Hey, that's yummy!" Merlots tend to be of medium body, not overly acidic or tannic, have a nice fruity taste, and go exceptionally well with chocolate. If a person is just getting started with red wine, merlot is another excellent place to start. Merlot is finally starting to recover from "Sideways Shock" -- as people remember what great value and flexibility they can get from this wine. While it has not yet regained mid-90's popularity, when everyone under the sun was ordering merlot, it's again become a player in the market. If you've shied away from the merlot aisle in your local wine store because you hear Miles whispering in your ear, allow Mike to bring you back. Three Blind Moose 2003 Merlot -- This California wine is very much what people would consider a "standard" merlot. Three Blind Moose is a perfect example of the "catchy label" wine -- since most wine buys are at least somewhat on impulse -- and merlot is a good "fallback" wine for people who just can't decide what they want. This cute label ("No sunglasses required!") wraps around a wine with a fairly strong nose of dark berries and wood. The body of the wine, though, isn’t tremendously assertive. The Moose give you a soft, fruity, easy to drink merlot, with some smooth berry and plum flavors and very gentle tannins -- not very dry at all. The finish is very mild -- there's a touch of spice at first, but that quickly fades back into the berry flavor. If you were going to do basic pasta with red sauce, chicken with spicy rice, or a steak salad, you could get away with this easily at $6-9. It would also be a nice wine just to sit and sip at the end of the day with some dark chocolate. Twin Fin 2003 Merlot -- If you'd like to see a nice contrast -- pour this side by side with the Three Blind Moose -- they're right at the same price point. This is another solid offering from California. Twin Fin is squarely in the "fun wine" category, but this straightforward wine has plenty of backbone. There's a light nose of blackberries and plums -- much less fruit forward than the Moose. Twin Fin has a strong medium body with just a hint of tannin at the first taste. This opens up into a big straightforward fruit -- black cherries -- as you drink it. There's much more tannin and earthiness in this wine than you'd expect from most merlots, and a little oak flavor comes through on the finish. Honestly, if I'd tried tasting this one blind, I'd have guessed that it was a light-styled zinfandel, not a merlot. The tannins and fruit would make this a winner with grilled foods (lamb chops would be fabulous), London broil, pastas with meat sauces or meat balls, eggplant parmesan, or stews -- think earthy flavors. I had this with a roasted eggplant and red pepper soup, and it was marvelous. At $6-9, you get an excellent value for a solid wine. Of the two, if you pressed me to choose, I'd say I enjoyed the Twin Fin more, simply because I like a heartier wine. Hogue "Genesis" 2002 Merlot -- Hogue has produced a very decent, inexpensive product for a number of years. When I saw they'd released a "reserve" merlot, I wanted to give it a go. They've named this wine "Genesis" in honor of the planting of their first vineyard over 30 years ago -- it's not a "Wrath of Khan" reference. Oftentimes, a "mass-market" winemaker will produce a reserve that honestly isn't all that different from their normal product. Hogue doesn't disappoint in that way. Genesis has a nose that could easily be mistaken for a cabernet sauvignon. It's almost smoky, with some raspberry notes to it. One would expect to get hit with a very dry, complex wine on the taste -- but Genesis throws you a bit of a curveball. The wine is peppery, like a zinfandel -- but without as much fruit as a zin, or most merlots for that matter. The berry flavor is much more subtle than the previous two wines. Instead, you get a flavor of dark chocolate -- and it would pair beautifully with anything containing chocolate or coffee. The finish is lasting and a little dry, with a return of the smoke you get on the nose. This one's a little more expensive -- probably more like $11-14, but what you'll get is a merlot that will almost certainly shock folks who think merlots aren't worth drinking anymore. Pair this up, as I've mentioned, with chocolate -- or even a good piece of grilled beef or pork, and you're going to get raves. Finally, returning to our poor friend Miles -- one of the inside jokes of "Sideways" surrounds Miles' most prized bottle of wine -- his 1961 Cheval Blanc. This is the wine he ends up drinking at his local burger joint during his "moment of clarity." In reality, the '61 Cheval Blanc is comprised largely of two grapes. One is merlot. The other is cabernet franc -- the other varietal he mercilessly slams in the film.